Near the top of the list of the most-loathed strength exercises has to be the pull-up. Maybe it’s the traumatic memories of gym-class fitness tests. Maybe it’s the sheer humiliation of hanging from a bar, pulling as hard as possible, and succeeding only in writhing like a hooked fish. Or maybe it’s the fact that pull-ups are, quite simply, very, very hard. Primarily, pull-ups work the lats (the big muscles on the sides of your back), the traps (the mid-back muscles), and the biceps—collectively known, fittingly enough, as your ‘pulling’ muscles. The core and shoulder stabilizers also contribute to this move. By performing exercises to strengthen these muscles, you can improve your chances of being able to complete a perfect pull-up. 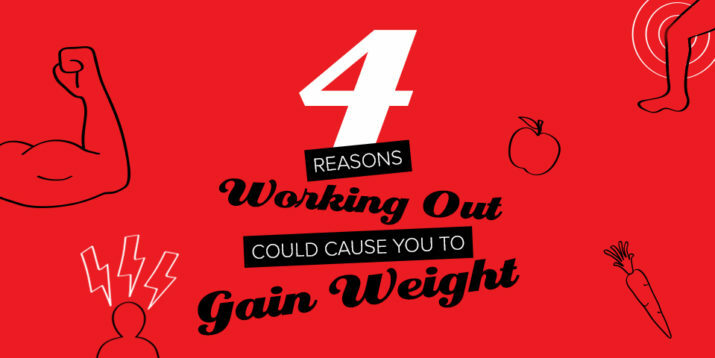 Why Should You Do Pull-Ups? Have you ever seen a guy on the beach with broad, muscular shoulders and a narrow, ripped midsection? Maybe you hated to see him go, but loved to watch him leave? Or has a woman in a low-back dress and a super toned back ever caught your eye? Pull-ups are a great move to help you sculpt these kind of beautiful back muscles. Pull-up power is also a good indication of overall fitness, which makes getting better at the move a worthwhile goal for anyone. “Pull-ups are the ultimate mark of the only metric that really matters in the weight room: relative strength, or how strong you are for your size,” Thieme says. 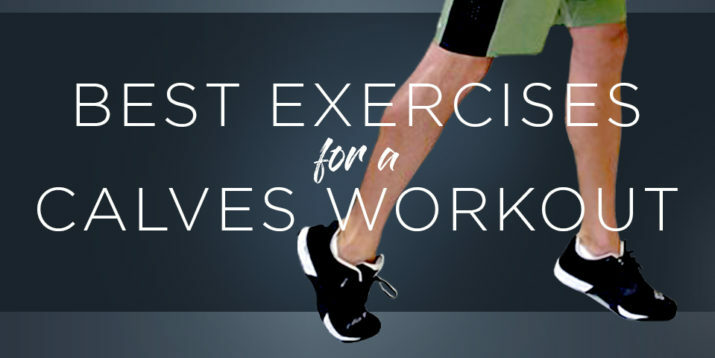 This is a perennially challenging movement that will continue to benefit you, no matter your fitness level. But if you’re struggling to even squeeze out one pull-up, then commit to the program below to get better at this move—one rep at a time. And for all those women who think they can’t do pull-ups, think again. Sure, women have lower centers of gravity, higher body fat percentages, and less fast-twitch muscle fiber than men, meaning pull-ups are naturally harder for females. But don’t let that become an excuse. Everyone can do the following pull-up exercises to become better at the move. 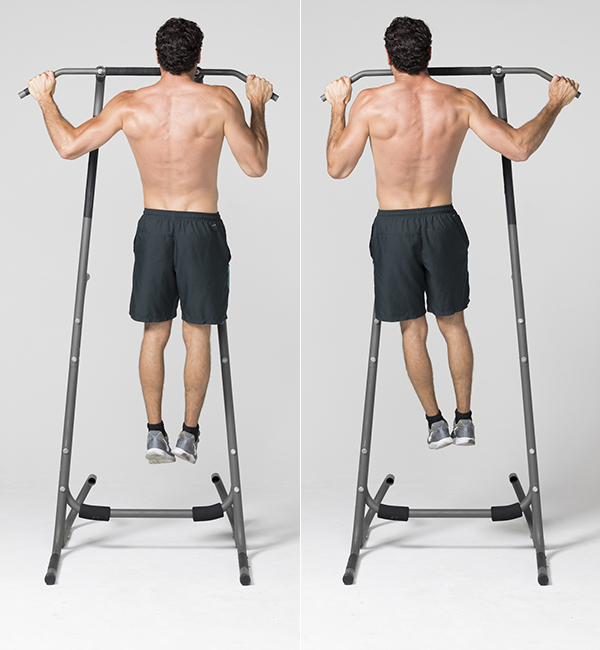 Grab a pull-up bar with an overhand grip that’s slightly beyond shoulder-width. Hang at arm’s length with your arms straight (a position known as a dead hang) and your ankles crossed behind you. Without swinging or kipping (using momentum to propel you upward), squeeze your shoulder blades together as you pull your chest to the bar (or at least your chin above it). Pause, and then lower yourself back to a dead hang. Do as many reps as you can with perfect form—then use that number to determine which step to begin the program. Perform that step three days a week during your usual workouts until you’re ready to progress to the next step. To that end, retest yourself every one to two weeks. Step 1: If you can’t do any reps. The fix: negative reps, bent over rows, scapular pull-ups, dead hangs. These moves will strengthen the muscles that are used for a pull-up without actually having to do one. How to do negative reps: Use a box, bench, or chair to boost your chin above the bar or simply jump up, using momentum to get to the top position of a pull-up. Take as long as you can to lower your body to a dead hang. Release the bar. Repeat a total of three times. How to do the bent over row: Assume a shoulder-width stance holding a barbell or a pair of heavy dumbbells with an overhand grip. Keeping your back flat, push your hips back and hinge forward, lowering your torso until it’s nearly parallel to the floor. Allow the weights to hang at arm’s length. That’s the starting position. Keep your elbows tucked as you squeeze your shoulder blades together and pull the weights to the sides of your torso. 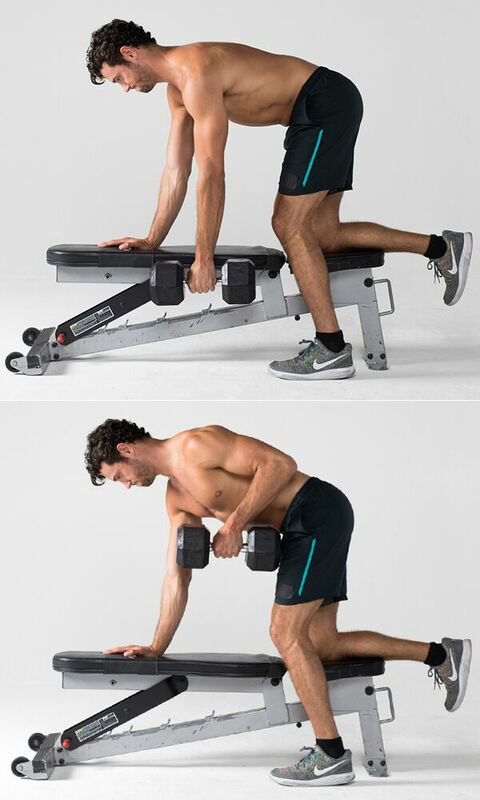 Lower the weights back to the starting position, and repeat. 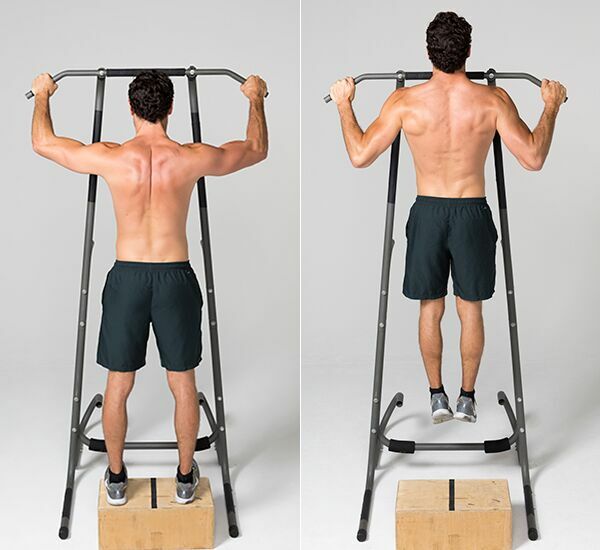 Do three sets of 10 reps.
How to do the scapular pull-up: Assume the same starting position as a classic pull-up. Without moving your arms, pull your shoulder blades down and back, raising your body a few inches. Pause, and then return to the starting position. Work up to three sets of 10 reps.
How to do the dead hang: Assume the same starting position as a classic pull-up (i.e., a dead hang). Hold it for as long as you can or 60 seconds, whichever comes first. Repeat three times. Step 2: When you can do two to five reps. The fix: low-rep sets, negative reps. If you’re strong enough to do a few pull-ups, terrific: what you need now is practice. The best way to accomplish that at this stage are with low-rep sets. Continue doing negative reps as well, following the directions in Step 1. How to do low-rep sets: Perform one to five reps of the classic pull-up in between sets of lower body exercises during each of your weekly workouts. The key is to stop just one rep shy of failure, so if your current max is two reps, do one rep each time. Step 3: When you can do six to 10 reps. The fix: high rep sets. You’re closing in on pull-up awesomeness! To improve, perform two sets of the pull-up on workout days. Start each set with the classic pull-up, stopping a rep or two shy of failure, and then finish each set with the band-assisted pull-up. 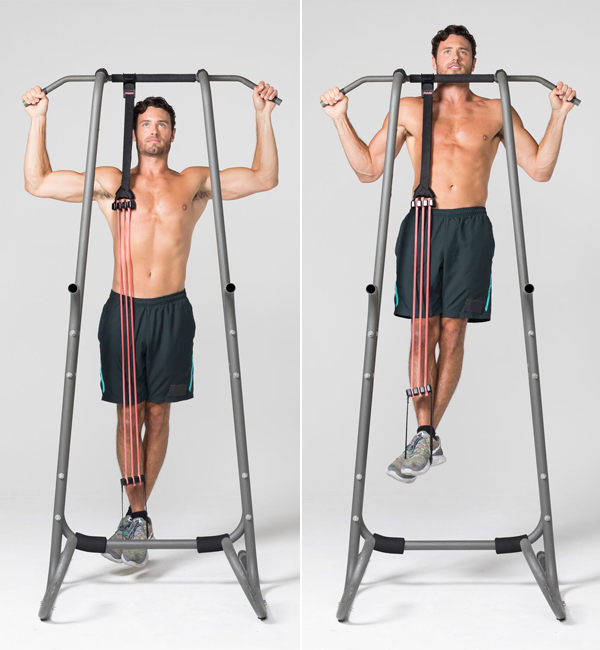 How to do assisted pull-ups: Attach the assist band to the pull-up bar. Stand on a box or chair and put one foot in the loop at the bottom of the device. Grab the bar with an overhand grip that’s slightly wider than shoulder-width grip, and then start banging out reps. Adjust the length of the strap and the number of elastic bands in the device to deliver a level of assistance that challenges you to complete 12 reps on top of however many unassisted ones you performed at the beginning of the set. 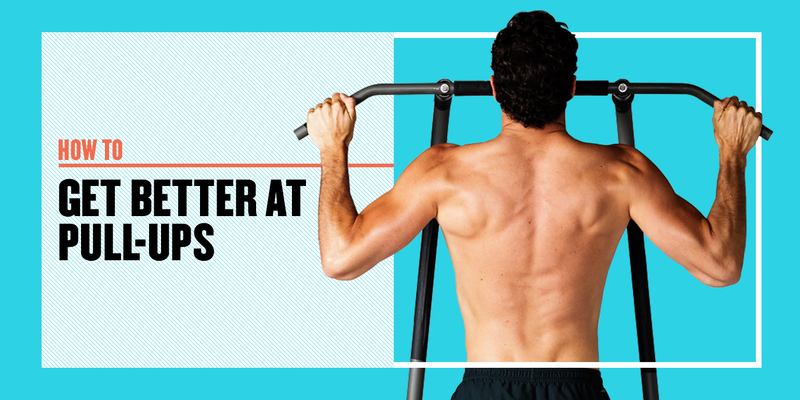 Step 4: When you can do more than 15 reps.
You’re a pull-up master! Congratulations, but your work isn’t over yet. The next step for you isn’t so much a “fix” as it is a new challenge; it’s time to progress to more advanced variations of the pull-up. 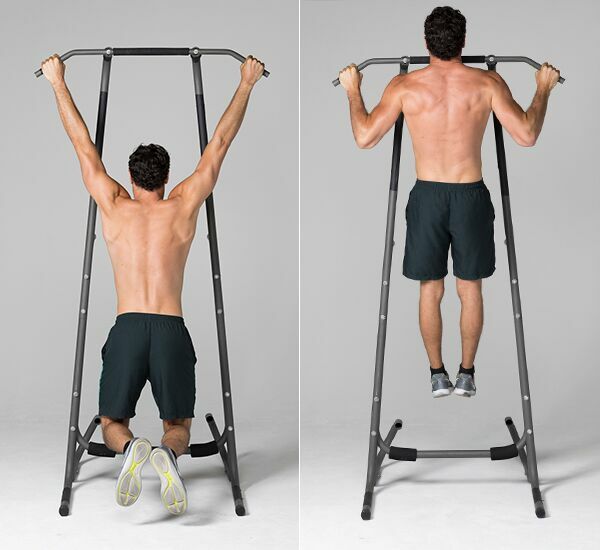 We recommend you start with the side-to-side pull-up and the knee raise pull-up. 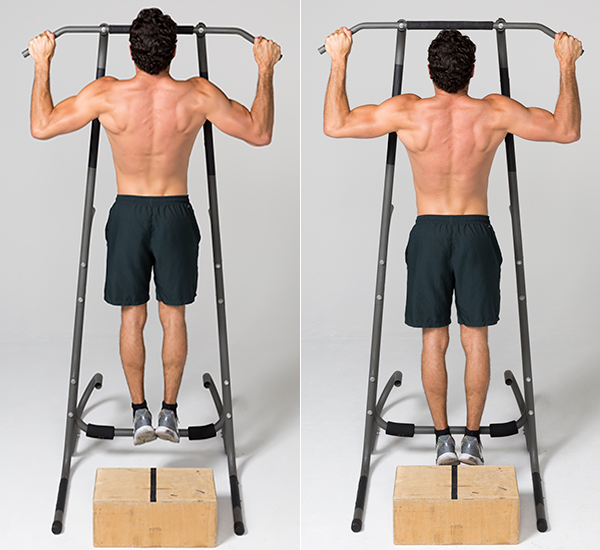 How to do the side-to-side pull-up: Assume the same starting position as a classic pull-up. Pull yourself up and to the right until your chin is near your right hand. Holding the “up” position, shift to the left until your chin is near your left hand. Lower yourself back to a dead hang. Repeat, this time lifting yourself towards your left hand first. Continue alternating sides with each rep. Do three sets of up to 10 reps.
How to do the knee raise pull-up: Assume the same starting position as a classic pull-up. Pull your chest to (or your chin above) the bar, and then raise your knees toward your chest. Reverse the movement to return to the starting position. Do three sets of up to 10 reps. Variation: Keep your knees lifted for the duration of each set.